It’s my birthday on Sept, AND it also marks exactly one year of launching my website and business. And while I’ve gone through a LOT of learning, a LOT of hustlin’, a lot of diggin’ deep and a lot of hitting my head against the wall, I can definitely say that there have been more up’s than down’s. And I attribute this to my mindset. 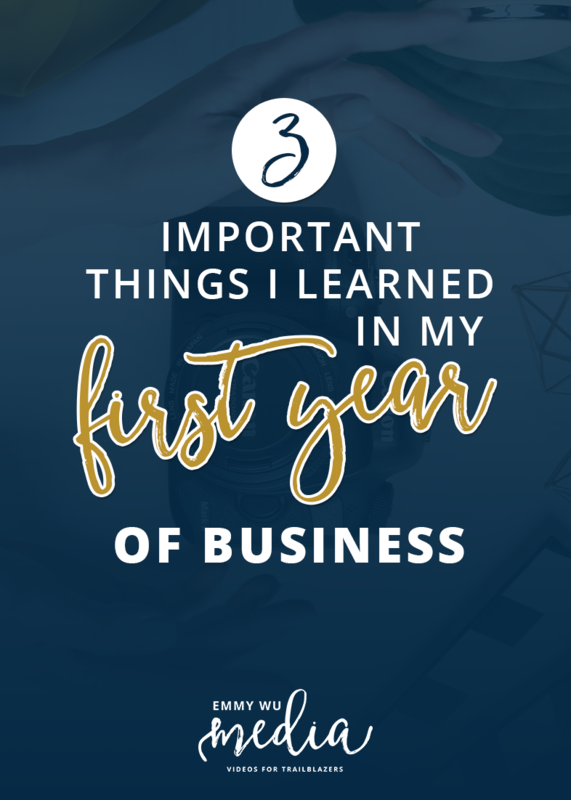 It’s ain’t easy running a business, and you’re definitely not always going to get things perfect the first time around, but I’ve learned a few things that have dramatically improved the way I run my business, and I wanted to share them with you today. Whether it’s in the form of video blogs, or a podcast, or a regular blog with pretty images you post on Instagram, choose one platform and start doing it consistently. When I first started my business, I knew that videos would be my medium of choice, but really, I had no idea what I was doing. I just created weekly video tips that were actionable and shared them on Youtube and Facebook. And at the time, I still had zero clients. And I had zero clients for a while. BUT when they did start flowing in, I was SO glad that I used that time wisely (‘cause lord knows I had a lotta time back then) because now I had a body of work that could very quickly grow that trust between my brand and a potential client. Having that consistent content that you share with the world shows that you’re committed to your business and gives potential clients a taste of your personality and what you’re like to work with. I can’t tell you how many clients have come to me after watching me on video and said that you seemed cool to work with! So whether it’s weekly, or just bi-weekly, set time aside to commit to growing this part of your business. It will pay off! Keep your head down and keep putting out your best work. I know when you’re first starting out, it’s hard to not look at what other people are doing and think to yourself, “hrmmm, that seems to work for them, maybe I should do more of that.” But don’t let yourself be swayed by other people in similar fields. Instead, follow your intuition and your passion about what you KNOW you can share with the world that’s valuable. It might take a little longer to catch on if it’s against the grain of mainstream popularity, but it doesn’t matter because it’s all about you BABY. And you’re in it for the long haul. There will always be NAYSAYERS in your industry. Whether they don’t think you’re credible because you’re newer than them, or make back-handed comments about you and your biz, expect to have disagreements but ultimately, it comes down to how you handle the situation. Or maybe it’s the other way around, and you just do not agree with what they’re saying or teaching … save that energy for something that fuels your own heart and don’t even go there. At the end of the day, you only you answer to yourself. If you’re keeping yourself inspired and moving towards your own zone of genius, that’s what will ultimately ensure the constant flow of clients because you’re showing the world that you’re committed to serving and you play a bigger game than he said, she said. Create systems in your business that will support you NOW. I know, why would you want to waste your time learning a client management software when you only have a handful of clients. But ain’t gonna be that way forever if you’re serious about your biz! If you told me one year ago that I would have 3 editors working with me on my team so keep business afloat, I would’ve never believed you. The thing is, if you’re planning on growing your business to a level that truly gives you the capacity to be the CEO and live the life that you love, it’s going to involve a team. You’re not going to be able to do all the client intakes and book keeping and newsletter automations and write blogs and create an e-course without losing your head. Start with documenting everything that you do in your business and list every single step out one by one. Yes, it’s tedious, but trust me, it will save you the time of training a new person every single time you bring someone on the team. I actually use a system that my mentor Yasmine Khater taught me to create an Operations Manual using Google Sites. It’s essentially a private site where you can list out your company mission statement, your ideal clients, and brand guidelines and just share that document with your new team member. Great lessons Emmy! Particularly like the sound of your Google Sites set up. Happy birthday and happy biz birthday too! Congratulations! Love the video. I attempted my first video. It’s a lot harder than it looks….I love the medium though. Now I have to get better at being natural on camera. Thanks Sue! You’ll get the hang of video! Just keep doing it and you’ll start to feel out your own comfort zone and what works for you. Don’t give up! I PROMISE you’ll get there! Congrats on 1 year! Great advice but the one I liked the most is about creating systems. I didn’t do this at first but it’s the first thing I do now, when starting out something new. It takes time to set up, but it’s SO worth it. Great video, Emmy, as always! Hadn’t even considered using Google Sites for an ops manual – LOVE that. Am scheduling that ASAP. Thanks for the insight. Thank you so much Kat!! It’s been hard to create consistent content while juggling client work, but it’s sooo important to commit to and a personal goal of mine to keep doing so! The ops manual totally changed my life, it’s sooo amazing! I know it will totally help to streamline your processes too!